Da fant jeg en video fra bandets siste skive. "...Now, the charismatic vocalist brings a new masterpiece to the market of epic rock with the new single, Draconian Love. Playful tunes meet thrilling guitar sounds. Tobias Sammet's remarkable voice duels with the raw, deep vocals of his duet partner, Herbie Langhans. Tobias Sammet tells how they chose the new single: Draconian Love' was the second single logically - the track isn't streamlined, but catchy. The fans were also a big part of the decision: We're on tour for eight weeks now and we're playing the song every evening and everytime - from New York to Tokyo - the crowd goes nuts. So the fans made the final decision. 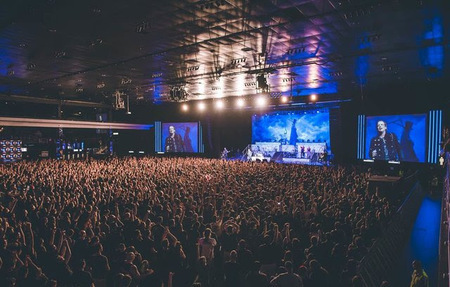 To underline this fact, we recorded the video for the song together with our Brazilian fans at the final show of the South American in Sao Paulo two weeks ago." Greit nok, jeg hadde ikke fått med meg denne mailen, to navn til føyer seg inn på listen. Det er Dee Snider (Twisted Sister) og Bob Catley (Magnum), faktisk to av mine favoritter fra yngre år, og ennå. 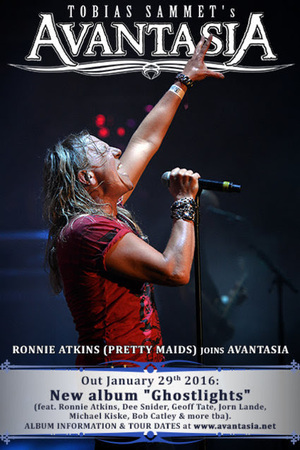 Pretty Maids-vokalist Ronnie Atkins er ombord. I tillegg til å gjeste på skiva, stiller Ronnie også opp på turneen, som ikke i skrivende stund har Norge på listen. Et par nye navn har kommet på plakaten siden jeg meldte inn Jørn Lande. Geoff Tate og Michael Kiske er på plass, da snakker vi sterke navn som garantert vil avhjelpe prosjektet til å selge. Ghostlights kommer ut i januar, jeg melder inn nyheter fortløpende på det som avsløres underveis. Lande er første annonserte vokalist på skive og turne. "The first guest vocalist for the new Avantasia album and tour can be announced. Jorn Lande will appear on Ghostlights (out in January via Nuclear Blast)." Tobias: "It is with great pleasure that I can announce the Beast From The North to join forces with Avanstasia once again. The striking viking : Jorn Lande! We've just finished his vocal recordings and he sounds - what a surprise - killer! Jorn is a monster! It is with even greater pleasure to let you know that Jorn is gonna do the world tour next year, kicking off in March! Avantasia live - three hours every night, from the Metal Opera to the new album Ghostlights. We'll be an epic line up and we'll deliver an epic show! Stay tuned!"